According to a new study by Gartner among +3,000 digital workers in the US, Europe and Asia/Pacific, many of them that work in non-IT departments believe their CIO is out of touch with their technology needs. Less than 50 percent of workers (both IT and non-IT) believe their CIOs are aware of digital technology problems that affect them. IT workers feel more confident than non-IT workers at using digital technology. The survey found that 32 percent of IT workers characterised themselves as experts in the digital technologies they use in the workplace. Just 7 percent of non-IT workers felt the same. “While we expect IT people to feel more confident with digital technologies, these findings highlight how hard it is to help non-IT workers feel as digitally dexterous as IT workers do,” said Mr. Andrews. Sixty-seven percent of non-IT workers feel that their organisation does not take advantage of their digital skills. “Organisations seeking to mature and expand their digital workplaces will find that expanding digital dexterity will accelerate this across the organisation,” added Mr. Andrews. About three in four digital workers either somewhat agree (48 percent) or strongly agree (24 percent) that the digital technology their organisation provides enables them to accomplish their work. 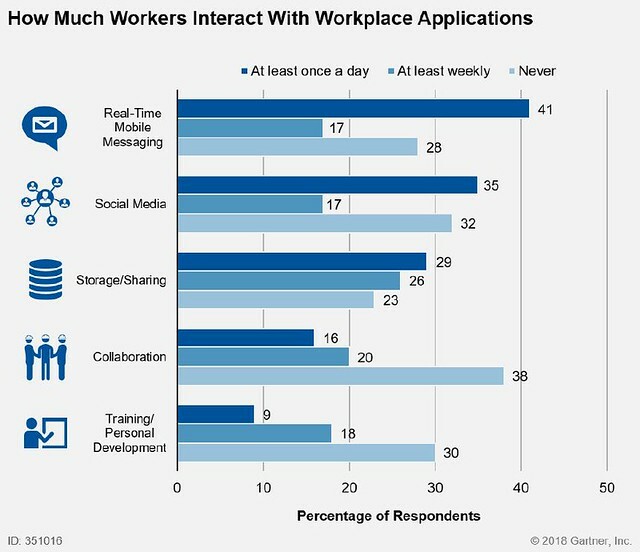 In addition, relative to the total workforce, a larger proportion of millennials consider the applications they use in their personal lives to be more useful than those they are given at work. “Our survey found that 26 percent of workers between the ages of 18 and 24 use unapproved applications to collaborate with other workers, compared with just 10 percent of those aged between 55 and 74,” Mr. Andrews said.